Paddy Power is the Irish bookmaker chain known for its laddish culture and publicity stunts such as paying out on some losers, making outlandish odds, and opening betting markets on everything from flies on a wall to next pope. Now, however they have undertaken one prank too far with an effort to shock and sensationalize by sponsoring a basketball game in Pyongyang, the North Korean capital starring the showman Dennis Rodman. Not funny especially as it is giving aid and comfort to rulers of a country where a dictatorial family has ruled for generations and up to 2 million may have died from hunger, murder and brutality. Many international human rights organizations accuse North Korea of having the worst human rights records of any nation. Detention, torture and other ill-treatment resulting in death, and executions is rampant Amnesty International reports reports the existence of prison camps, where 200,000 political prisoners and their families exist in “the most inhuman conditions imaginable." North Koreans have been referred to as "some of the world's most brutalized people" by Human Rights Watch. Into this walks Paddy Power sponsoring a basketball game of former NBA players led by Dennis Rodman against a North Korean side. It is the kind of circus event that the North Koreans will pounce on to pretend all is well in the Hermit Kingdom. Paddy Power is essentially aiding and abetting that image. The current North Korean strongman Kim Jong-Un is said to be a basketball fanatic and Rodman has already made a few trips to the Hermit Kingdom to be hosted and feted by him. It was from these encounters that the idea of the basketball game came about. “North Korea has given me the opportunity to bring these players and their families over here, so people can actually see, so these players can actually see, that this country is actually not as bad as people project it to be in the media,” Rodman told the Associated Press on Thursday. This is where Paddy Power is making a massive mistake. 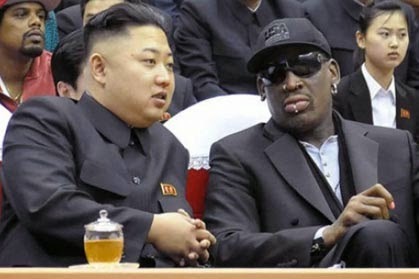 While it is fun to drive Rodman around Rome, having him as an apologist for a genocidal regime is very different. Kim recently had his uncle gunned down by firing squad, there is talk of a massive crackdown along the lines of China’s notorious purges in the 1960s. Into the middle of that walks Paddy Power and Rodman with a cheap publicity stunt. The long suffering North Korean people deserve better.